Half-Life's Main Menu can be accessed at any time during a game by hitting the Escape key. Use your mouse or the up and down arrow keys to navigate inside of the Main Menu. Hit the Escape key at any time to go to the previous screen. Before starting a game, your Main Menu choices include: New Game, Hazard Course, Configuration, Load Game, Multiplayer, View readme.txt, Previews and Quit. NEW GAME: When you start a new game, you'll be asked to choose a level of difficulty. Easy Monsters are weak and are easy to kill. Medium Monsters are strong and are easy to kill. Difficult Monsters are strong and are difficult to kill. HAZARD COURSE: Access the Hazard Course at any time during the game to perfect maneuvers like jumping and crouching, using objects, and firing weapons. The Hazard Course includes a target range as well as water and obstacle courses. A holographic guide will assist you through the course. If you are new to action games, we highly recommend that you visit the Hazard Course before you begin a new game. CONFIGURATION: Set game options, optimize video and audio settings for your system, and customize keyboard controls to your liking. See more info below. LOAD GAME: Select and start a previously saved game. MULTIPLAYER: Join a multiplayer game on the Internet, chat with other Half-Life players, set up your own LAN, or customize your player character. See here for more information about Multiplayer options. VIEW README.TXT: Half-Life's Readme file contains basic information on system performance, product features, and troubleshooting. We recommend that you read it before playing. PREVIEWS: No longer supported. 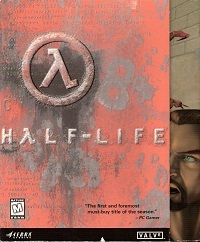 Selecting this used to get you information about Half-Life: Team Fortress and other then up-coming Sierra Studios releases. QUIT: Exit Half-Life. Don't forget to save your game. Resume Game: If you are in the middle of playing Half-Life when you enter the Main Menu, use the Resume Game menu item to return to the action. Save/Load Game: Save your game or load a previously saved game. You may also save your game quickly from within Half-Life by pressing Quicksave (F6). Load this game by pressing Quickload (F7). Only your most recent Quick-saved game can be selected from the Save/Load menu. Set game options, optimize video and audio settings for your system, and customize keyboard controls to your liking. After setting your configurations, hit the Done button to apply your settings and return to the Main Menu. Hit the Use Defaults button to restore the original default settings. The grid shown in the Controls Dialog box lists the default keyboard and mouse configuration. It also makes it easy to customize the configuration: just click on an action in the first column, press Enter, then press the key you wish to associate with that action. Action - Describes the player action. Key/button - Specifies the key or mouse control associated with that action. Alternate - If you want to make an action accessible by more than one key or button, select an alternate in the right-hand column. See the Controlling the Action section for a listing and description of Half-Life's default mouse and keyboard controls. Crosshair - Adds a crosshair symbol to help you aim your weapons. Mouselook - Changes the mouse function from controlling your movements to controlling your ability to look around. Note that checking Mouselook disables Look spring and Look strafe. Look strafe - In combination with your mouse look modifier (;), this causes left-right movements of the mouse to strafe (slide you from side to side) rather than turn. It also returns your view to center screen when you begin moving. Joystick - Enables joystick input. For information on configuring your joystick, refer to the Readme.txt file. Auto aim - Automatically aims your weapon, making it easier to hit your target. Game sound volume - Adjusts the volume of the game's sound effects. HEV suit volume - Adjusts the volume of the instructions provided by your HEV suit. High quality sound - If the speed of your computer is 166 Mhz or more, check this box for even richer, higher quality sound. To hear Half-Life's music, you must have the CD in your CD drive. To adjust the volume of the music, go to the Start Menu/Programs/ Accessories/Multimedia, and select the Volume Control applet. Set video options such as screen size, gamma and glare reduction. Changes made to these controls will be reflected in the sample image window. Screen size - Controls the amount of screen space the game uses. Reducing the screen size can often improve performance. Note that you cannot adjust the screen size if you are using an OpenGL video driver. Gamma - Adjusts Half-Life's color balance to best suit your monitor. Move the slider until you can just make out the figure standing in shadow on the right side of the sample image. Glare reduction - Adjusts darker colors to reduce glare on your monitor. Move the slider until you can see the camouflage pattern on the soldier's uniform. Set video modes, choose video drivers. Half-Life will check your system for the presence of OpenGL and Direct3D video drivers. It may ask you to verify the results of this check. If you have one or both drivers currently installed on your system, they will appear as choices at the top of this screen. You can also choose to run Half-Life in software mode. If you do not have these video drivers installed, Half-Life will default to software mode. Display mode Half-Life evaluates your system's graphics adapter and automatically lists the display modes available for your computer. Selecting a higher resolution mode generally results in better quality images, but can lower game performance. Run in a window - Check this box if you prefer to run Half-Life in a window rather than full screen. Use mouse - Check this box if you are using the mouse to play Half-Life. Leaving the box un-checked will allow you to use the mouse outside the game window. Use this feature to turn off blood and gore effects. This is a password-protected feature, designed to let parents control the level of violence. You will need to re-enter your password to turn the effects on again. No longer supported. Selecting this used to update the latest Half-Life code, including new hardware drivers and bug fixes, if necessary. You were able to see if a new update is available before you connected.